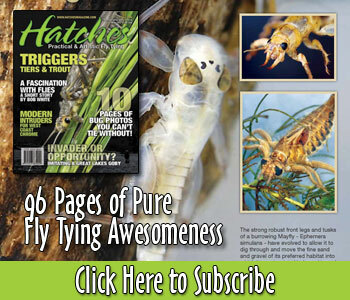 Hans Weilenmann ties a simple mayfly pattern that can easily be adapted to meet and local hatch in color and size. The reverse method of tying the hackle for a fly (dry or wet) allows for a very clean head and ensures yout hakle is clean by the eye. which I can make easy. 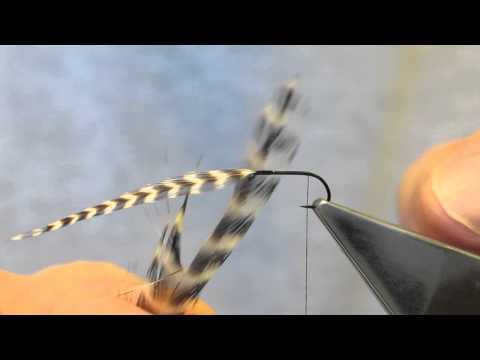 Once I learned to tie my wet fly hackles that way, I started to employ the same method for my dries too. Like you say, much neater head, plus the reinforcement factor of bringing the thread back through the hackle – what’s not to like? I will rate it a 5. Because it’s faster and cleaner looking and also nicer looking heads. Good job Han’s. Wonderful! I do some tying in my spare time, which isn’t much, and never liked how the head of my flies came out. This will truly make me happy with them! How would one add a wing,say feather, yarn, deer hair and at what point? Brilliance, elegance, and simplicity all abide here. Hard to imagine this has not always been the prescribed best method. This insures better proportion of the entire fly, strenght and neatness. A little research may be in order . . . Chauncey Lively was tying reverse hackle flies in the early 70’s. There is a pattern and pictures in Chauncey’s book. wonderful..good reminder of this great technique.